For the final week of Get Your Paint On I decided to paint another animal after been successful with the geese last week. I've never painted animals before this, especially in any representational kind of style, so I thought I'd continue in this direction. 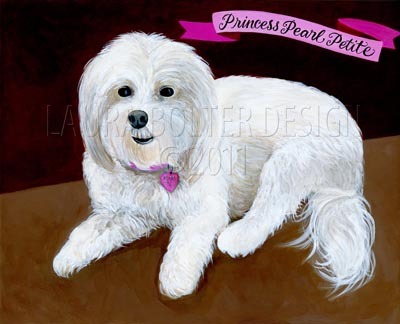 Princess Pearl Petite is the most amazing dog in the world—made for loving and cuddling, she's a 14.5 year old Maltese who's been through a lot in the last year. This week her arthritic leg is really bothering her and it breaks my heart. I carry her around so she doesn't have to walk on three legs. I've always thought it would be cool to paint a portrait of her and now seemed the perfect time—much better to do it now while she's still around! This is was scanned. I'm having a difficult time adjusting it to get the colors right. I've also taken a photo of it in my photostream. Here's the reference photo. The size is 11 x 14". I'm having trouble painting the fur and getting the darker areas to receded, particularly on the right front leg where it bends and under the collar. I also tried painting on Gessoboard this time. I found the surface very slick working with acrylics—paint seemed to dry even faster, had troubles blending, and had problems with the paint adhering in some places. Perhaps it would have helped to sand a bit first. Last week I painted on an unprimed cradled board and liked the more absorbent surface better. I'm not sure it's quite finished yet, but didn't want to wait any longer to post to the class group. I look forward to any comments and suggestions. And, if it changes significantly, I'll repost.